A Footed Openwork Compote in White and Peach. 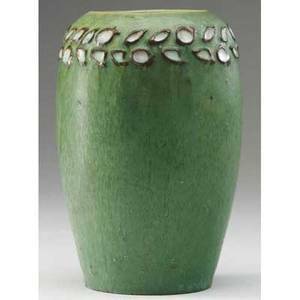 With gold accents and foliate decoration on base. Medallions with "H" within. Height 8 inches. 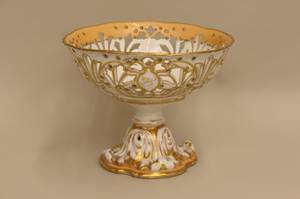 Archived auctions similar to A Footed Openwork Compote in White and Peach. 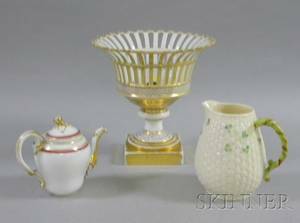 Paris Porcelain Gilt Decorated Openwork Compote Demitasse Pot and a Belleek Porcelain Jug. 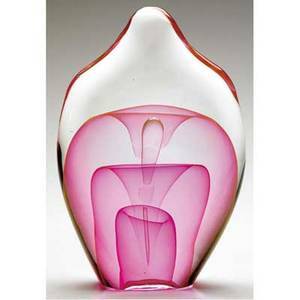 Dominick labino fine and early glass sculpture from the emergence series with internal veiled decoration in pink and peach, 1975. signed labino 8-1975. 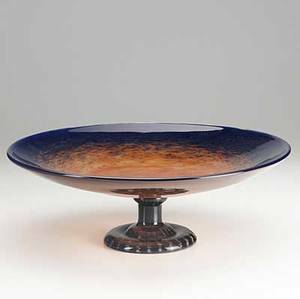 8 3/4" x 5 3/4"
Schneider compote in orange and indigo glass. some shallow scratches. 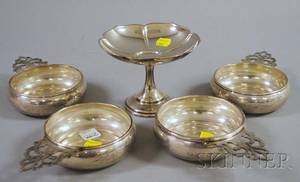 inscribed schneider france 4 3/4" x 14" dia. 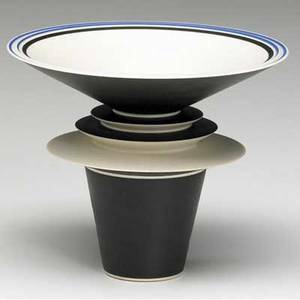 Rosalie delisle delicate porcelain sculptural footed cup glazed in black and indigo. signed and marked t.r.w. 13. 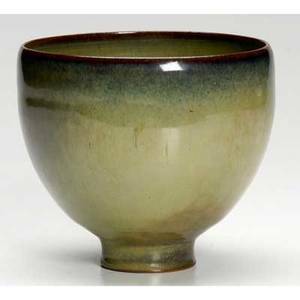 3 1/2" x 4 1/2"
Scheier footed vessel covered in olive and blue semi-matte glaze. 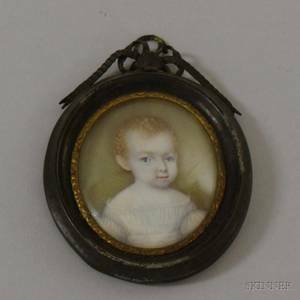 incised scheier. 4 3/4" x 5 1/4"